Iranian national, Ms. Soheila Beiranvand recently arrived in Australia with her husband and two children to undertake a PhD at the University of the Sunshine Coast. 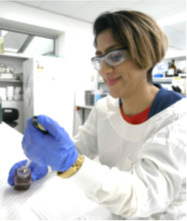 In her project, Soheila will examine the anti-inflammatory potential of Australian honeys and their constituents. Soheila gained valuable research experience in Iran. She completed a doctorate in Pharmacy at the Jundishapour University of Medical Sciences, Ahwaz, Iran, and then worked as a Clinical Pharmacist at Kurdistan University of Medical Sciences, Qods Hospital, Sanandaj. In 2009, Soheila accepted a position in the Food and Drug Administration (FDA) at the Kurdistan University of Medical Sciences, where she assessed antimicrobial prescribing practices within 14 regional hospitals. Soheila is delighted to be in Australia and is looking forward to commencing her project and to meeting and interacting with other members of the broader CRC group.